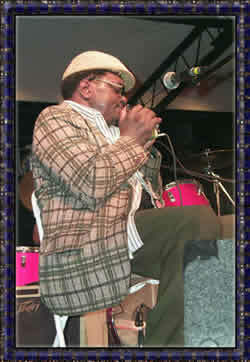 Born in Mississippi, Arthur Williams is one of the few remaining authentic Delta-style blues harp masters. While growing up in Chicago, Williams carefully listened to the records and radio broadcasts of his two idols, Sonny Boy Williamson and Little Walter. He went on to play with Elmore James, Eddie Taylor, James Cotton, Junior Wells, and the great Muddy Waters. Arthur's harp prowess on Frank Frost's 1966 album earned the respect of legions of music critics and fellow bluesmen. After moving to St. Louis, Williams recorded and toured with Big Bad Smitty. An incredibly gifted harmonica player, Williams is finally achieving his long-overdue recognition as a world-class musician. MP3s from Midnight Blue CD, enjoy!